Colors are approximations. 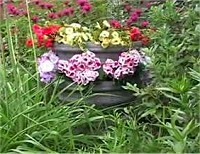 Colors may appear differently on different screens and vary widely depending on the light or shade on your rain barrel. To select your color, simply click on the Add to Cart button below and then make your color choice from the drop-down menu provided on the Shopping Cart page. Open up the center cap and... drop the peel into the hole!